The technology seems to be at quite an elementary level, with the signal detected serving only to let you do quite simple tasks like move objects on screens, sort through pictures or rotate a cube. But Emotiv are predicting some great uses for the technology when it becomes more advanced. Their CEO Tan Le gave a speech at the TED conference – worth checking out if you’re interested. Artistic and creative expression – Use your thoughts, feeling, and emotion to dynamically create color, music, and art. Life changing applications for disabled patients, such as controlling an electric wheelchair, mind-keyboard, or playing a hands-free game. Games & Virtual Worlds – Experience the fantasy of controlling and influencing the virtual environment with your mind. Play games developed specifically for the EPOC, or use the EmoKey to connect to current PC games and experience them in a completely new way. Market Research & Advertising – get true insight about how people respond and feel about material presented to them. Get real-time feedback on user enjoyment and engagement. However, it’s all rather fledging so far. Problems seem to include having hair – it gets in the way of the electrodes which are supposed to make direct contact with your skin, and the fact that it is hard to train the device to respond to your particular thoughts. See a forum where those issues are raised here. It packs with a device called EmoKey – this links your thoughts or emotions to strokes on the keyboard. For example, if you smile during an instant chat conversation, then smile recognition software will insert a smiley :) into the text you are typing. Geek and sci-fi writer Greg Dawe got all excited about the possibilities for this, something we covered in a blog post here. When your iPhone can read your mind… wacky sci-fi becomes reality..
Wow! This is great. I’ve read that they don’t allow access to the raw EEG data, unfortunately. 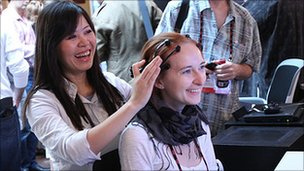 I’m much more interested in using devices like this to record my brainwaves, than to play games. I couldn’t find it for sale in epub format so wound up buying it as a pdf. Don’t know about on your Kindle, but on the Sony Touch reader pdf’s are not great to read.Emotiv are predicting some great uses for the technology when it becomes more advanced. Their CEO Tan Le gave a speech at the TED conference – worth checking out if you’re interested The text size and scaling is less friendly, page turns feel slower and the reading experience just isn’t as good.